Before I was introduced to the fishing rod mount for truck, my fly fishing trips always started with a lot of hassle, I would either have to travel with a dismantled fishing rod and then get to the river and begin setting it up or have my brother tag along so that he could hang on to the rods so that they remain in place until we get there. Well now I have the mounts and going fishing is a lot of fun. Why you need a Fishing Rod Mount for Car? For some people it may be fine to assemble the fishing rod when they get to the fishing site but for most of us that means more time spent assembling and less time fishing so it is would be more practical to assemble the rod even the night before and add the fly so that you are ready to go and then just mount it onto the fishing rod car mount which will keep it tidy the entire journey. I remember a time when we were out fishing with my buddies and there just did not seem to be enough fish at that location so we decided to drive down to another location. At that time I did not have a mount so I had to spend close to 5 minutes trying to fix my rod in the car in the best possible position in which it would not get dismantled or entangled under my camping gear, while my friends with mounts simply slid in their rods and were off. I since realized that the fishing car rod mount is quite convenient and you probably would find it that way too. This is probably the most preferred choice for many people. It has strong magnets that can stick to the body of the car. In most cases, you will put one mount on the hood of the car and another on the roof, though I have seen some people place them on the side of their SUVs – that means you cannot open the doors on that side. The advantage of the magnetic mounts is they can be removed after the fishing trip and stored away. I also find them reliable since the magnets tend to hold on firmly almost like the permanent mounts. These are also removable and have strong suction cups that will stick to the body of the car. People who use these fishing rod car mounts say they like them because they do not affect the paint of the car as well as the surface, unlike magnets that sometimes may cause some unevenness on the surface due to mild scratches. My quarrel with these, however, is that the ones that I tried tended to lose suction after some time of use, so I had to replace them. Other than that, they were just as convenient as the magnetic ones. These fishing rod mounts are fairly permanent. You can put them on the top of the car just like ski racks. They can accommodate more rods, but it is best for bigger cars so that they are not sticking out from both the front and back of the car and causing the risk of the fly tips getting caught by tree branches or being damaged by the wind. The great ting about the rack is that it can also be used for other things like carrying more camping gear that may not fit in the car. When you are choosing a fishing rod mount for your car, a lot of the decisions come down to personal preference but here are a few important aspects that do not fall into that category. Personally I drive a Rav4 which I would categorise as medium size and I noticed that the fishing road is just about the same length as the car so when choosing a mount it made sense to have one that can hold the rod from the front of the car to the back since a rack would have had the rods balancing in the middle. It will make more sense to go for a rack if your car is big. Big cars also have the advantage of being able to install racks inside the car which comes with a few advantages like safety. 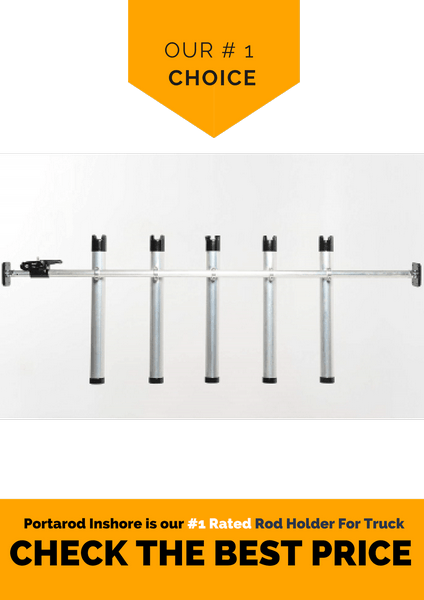 Naturally the size of the rods will determine what kind of car rod rack you will choose. If for example, you are going camping, it is likely you will need to carry more stuff so having a rack that can also accommodate more stuff is a practical thing to take into consideration. As with anything that you buy, it is important to know how durable it is, no one wants to spend money on something, and it gets spoil within a few days or months. Going for particular brands and ensuring you have a warranty can ensure that you get a durable and reliable rod mount. With advancement in technology, you may want to find a mount that has added features for example extra rubber rings to ensure the safety of your rods as well as protection for your car surface. Once you have taken these into consideration, you can then think about making a particular choice. From my experience, as well as interaction with other owners of fishing rod car mounts, here are the best five recommendations. This fishing rod mount, and I found it very strong. I tried driving fast in the wind to see if the magnet may lose its grip but it remain stuck and yet removing it is not hard at all. Tthe best part is they are resistant to the weather conditions so they will not rust or corrode. Solid Holder system will not allow rods to twist or turn. Lightweight has the capacity for six fishing rods. This is best if you want to mount the rods inside your truck. No permanent intstallation needed and luckily there are no drilling or screwing into vehicle. I find it convenient in case I decide to use it also for storage in the garage because it can be installed there as well. Can work horizontally or vertically and adjustable for the best fit. Rods can be placed high in the center of the vehicle as well as outside so it provides a plenty of room inside the truck for your dog or fellow passengers.. Solid and durable fishing rod holder one fit solution which suites for truck, SUV, wagons. This gives a storage capacity of up to 5 fishing roads, and you can install it easily and remove it. Fully removeable locks are available and there's no absolute need to drill or bolts for fitting. The support bar is exapandable and will easily fit into any car, suv or truck. This is the fishing rod mount one of my friends has, and he likes to stick it on the side of his SUV, and the rods are actually able to stay in that position. If you worry a lot about the surface of your car, then you are likely to appreciate this fishing rod car mount. I was impressed at how soft it is on the body of the car and yet it still manages to provide a good hold onto those rods and keep them from flying off. When you take into consideration, everything and the different features each of these fishing rod car mounts have, you are likely to end up zeroing in on the Portarod Inshore 5-Rod Holder ​since it provides the most convenience as well as effectiveness. In my experience, it is the lightest and also most flexible but no doubt sometimes personal choice may vary. Flyfishtrapper.com is a participant in the Amazon Services LLC Associates Program, an affiliate advertising program designed to provide a means for sites to earn advertising fees by advertising and linking to Amazon.com.